Winter can be tough on all of us, but with a little TLC, your flock will do just fine. My 18-week-old pullets in the yard have become the hens’ chickens. Gone are the days when the hens would lounge over here, later over there, and roost inside the coop in the middle of the afternoon just to get away from them. Today, the hens play with the pullets, following them as they run and fly across the yard, and then halt to a stop because they never had a destination in mind. This is good news because the increased activity will help the old hens stay warmer and healthier through the winter season. Keeping hens active in the winter is part of keeping them healthy. Here are three things you can do to encourage a healthier winter season. The need for clean and available drinking water doesn’t decrease in the colder months. Hydration is necessary for a thriving flock year-round. Make sure water is available at all times with a heater under your double-walled metal waterer or with another heated water source. If you find that your heater or heated bowl has failed because the flock’s water has iced over, offer warm water immediately and continually until you fix the problem. If you don’t have a heat source for your flock’s water, today is the day to pick one up. As the weather gets colder, heaters and heated bowls become harder to find. If you get a lot of snow, no doubt your chickens will avoid it and stay indoors like mine do, especially if the snow is taller than their shanks are long. But you can encourage activity by paving a way to range. Shovel paths through your yard that the flock can walk through. Then, entice them out into the yard with forage sprinkled along the path. 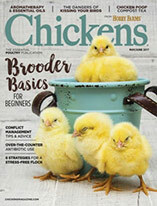 Sprouts, fodder, scratch and kitchen scraps are all great forage options that will be enticing to chilly chickens. Eating and moving creates body heat and eases boredom that can lead to the chickens pecking at one another. 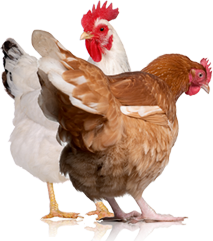 Chickens’ body temperatures run between 105 and 107 degrees F, and they can usually heat their own coops in the winter. In most areas of the country, heating a coop is completely unnecessary. While ventilation is important to let out excess moisture that can cause frostbite, drafts will wick away all that heat, which can be very dangerous for your flock. Every type of coop has benefits and drawbacks, but what I love most about my mobile ark coop in the winter is that I can turn it to block winds. If my coop’s long side faces oncoming wind, the wall acts like a windbreaker. Turn my coop 90 degrees, and those bitter winds will blow straight through the ventilation, causing wind through the coop. If you’re able to move your coop to block winds or move it to a north-facing fence, you can keep cold winds from ripping through the flock. If your coop isn’t mobile, put up a windbreaker, which can be as simple as securing a tarp over the drafty areas and on the north wall of the chicken run or as elaborate as stacking bales of straw on the north side of your coop and run. 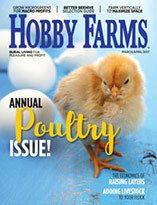 What do you do to keep your flock happy and healthy in the winter months?